I kept thinking of Yogi Berra’s line “It’s déjà vu all over again” as I pored over dozens of scientific papers, reports, and articles on flame retardants and talked with experts over the past month. Current concerns about certain flame retardants—especially brominated flame retardants—bear striking resemblance to concerns expressed in the 1970s about other compounds that were designed to protect us from the risks of fire. 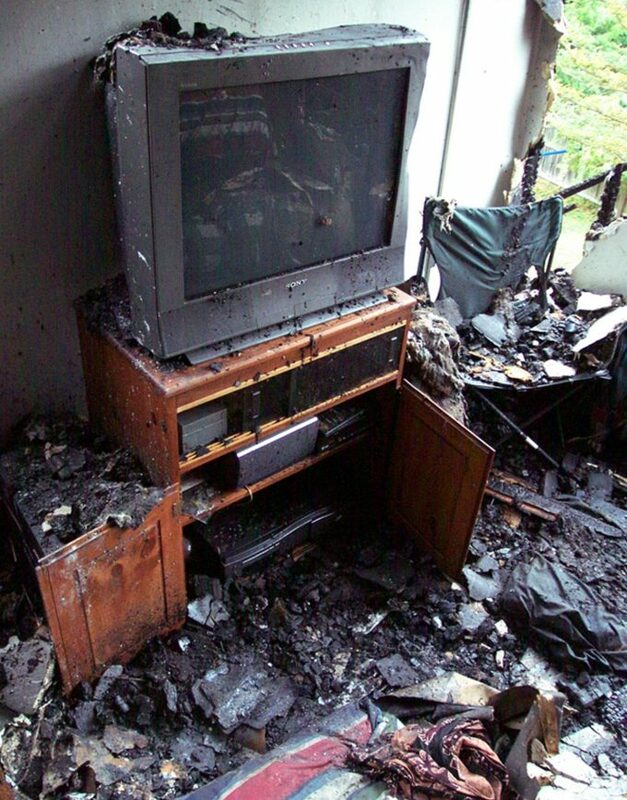 Damage from a candle-ignited fire that destroyed a campus fraternity house in Amherst, Massachusetts—brominated flame retardants probably prevented this television from fully igniting. brominated biphenyls (PBBs), flame retardants that are chemically very similar to PCBs but made with bromine instead of chlorine, were banned in the ’70s after a tragic mix-up in Michigan. polybrominated diphenyl ethers (PBDEs) emerged in 1999, when Swedish researchers reported that levels of these chemicals in human breast milk had increased 60-fold between 1972 and 1997. Follow-up studies in the San Francisco Bay Area found PBDE levels in breast milk that were six to ten times higher than levels in Sweden. At the same time, laboratory studies suggested that the health effects might be similar to those of PCBs—ranging from interference with brain development to altered hormone function and cancer. The manufacturers and industry associations representing these flame retardants tell us that the chemicals are safe, but weren’t they saying the same thing about PCBs and PBBs three decades ago? Meanwhile, we’re using orders of magnitude more brominated flame retardants today than we were when PBBs were banned. EBN has ever put forth. It could be a rough ride, but hop aboard! Before we get too far into the health and environmental risks associated with flame retardants, it is important to point out their many, very significant benefits. From 1992 through 2001, an average of over 4,200 people were killed by fires each year in the United States and 25,000 injured (not including victims of the attacks on September 11, 2001), according to the U.S. Fire Administration of the Department of Homeland Security. More people are killed by fires in the U.S. than from all natural disasters combined. In 2001, exclusive of September 11, there were over a half million structure fires in the U.S. with a total property loss of $10.6 billion. Accidental fires are also a significant source of environmental contaminants and toxins, including persistent organic pollutants (POPs) such as dioxins and furans. Relative to the quantity of material burned, pollution emissions are far higher from an uncontrolled structure fire than from a municipal incinerator, because the combustion temperatures are typically lower and oxygen may be limited. Because flame retardants make products less likely to catch fire, a strong argument can be made for their use—in the interest of safety and protection of property. Use of flame retardants is driven to a very large extent by life-safety codes that are designed to protect us and our property by regulating how quickly a fire will spread, how much smoke it will produce, and whether it will self-extinguish. pyrolysis). With wood, as the temperature reaches about 300°F (150°C), these volatile gases (a mixture of short-chain hydrocarbons, hydrogen, and oxygen) are released as smoke. At about 500°F (260°C), hydrogen (H) and hydroxy (OH) radicals break off from the hydrocarbon molecules, leaving carbon atoms that react with oxygen in the air—combustion. This combustion process releases carbon dioxide, water vapor, and heat—which fuels the pyrolysis. ignition phase of a fire. Once a fire is fully engaged, flame retardants have little effect. Thus, flame retardants should be thought of as only one element in a multi-part strategy for preventing, allowing for escape from, and extinguishing fires. Halogenated flame retardants (those containing bromine and chlorine) function primarily by removing the H and OH radicals during the ignition phase of a fire. When heated, halogenated flame retardants release bromine or chlorine radicals; these react with the hydrocarbon molecules in the flammable gas mixture (smoke) to create hydrogen bromide (HBr) or hydrogen chloride (HCl). These gases then react with the high-energy H and OH radicals, releasing water vapor and the lower-energy Br and Cl radicals—which may remain available to repeat the cycle. To summarize, the halogen radicals released as the material heats up interfere with gas-phase combustion, slowing or blocking ignition. Brominated and chlorinated compounds differ in their flame-retardant properties. Bromine-hydrocarbon bonds are weaker than chlorine-hydrocarbon bonds, so bromine radicals are released more easily as the material is heated. These bromine radicals are also released over a narrower temperature range, so they tend to be more concentrated as a fire starts and, thus, more effective at stopping the fire. reactive flame retardants. As we will see, this distinction affects how easily the flame retardants can escape from a plastic (without a fire) into the environment or your building. Other flame retardants function in quite different ways. Phosphorous flame retardants act on the solid phase of the combustible material, rather than the gas phase. When heated, phosphorous reacts to form phosphoric acid, which chars the solid. This charring inhibits pyrolysis (the decomposition and release of volatile gases), so less fuel is fed to the fire. As with brominated flame retardants, some phosphorous flame-retardant compounds are mixed with the substrate and physically held in place (additive), while others are chemically bound to the substrate’s molecules (reactive). Halogenated organic phosphorous compounds, including tris (chloropropyl) phosphate (TCPP) and tris (chloroethyl) phosphate (TCEP), rely on both the gas-phase flame retardant properties of halogens (in this case, chlorine) and the solid-phase action of phosphorous. Nitrogen-based flame retardants such as melamin cyanurate (MC) provide a cooling effect, and they release a noncombustible gas (nitrogen) that dilutes the oxygen atmosphere around the material. synergists with halogenated flame retardants. Antimony trioxide acts as a catalyst to speed the release of bromine or chlorine radicals. It also reacts with the halogen radicals, forming antimony halogens that help remove the high-energy H and OH radicals, thus helping suppress the fire. Intumescent coatings provide a quite different form of protection against fire. They are applied as coatings on wood, plastic, steel, and other materials, and when heated they expand to form a fire-resistant and insulating layer. Intumescent coatings can keep flammable materials from burning, but they can also protect nonflammable materials, such as structural steel, from heating up and weakening in the event of a fire, thus preventing or delaying structural collapse. As can be seen, the chemistry of flame retardants is complex. More than 175 flame retardant compounds are currently on the market, and the industry is worth over $600 million dollars per year in the U.S. and nearly $2 billion worldwide, according to the European Flame Retardants Association (see chart). Flame retardants are far more common than most of us realize. Many materials contain quite high levels of flame retardants: cellulose insulation is about 20% flame retardant by weight, plastic television and computer cases are often 10–20%, and polyurethane foam cushioning can be up to 30%. Some materials have very low levels of flame retardants: polystyrene foam insulation is typically 0.5–2.0% HBCD (hexabromocyclododecane) by weight. Manufacturers of products with less than 1% flame retardant might not list it on the Material Safety Data Sheets (MSDS), since it falls below the threshold for required listing. EBN obtained for polyisocyanurate insulation, only those from Dow Chemical listed any flame retardants, leaving the impression that some polyiso is formulated so as not to require flame retardants. Polyiso does contain flame retardants (about 5% by weight), but because those chemicals are formulated into the polyol component used in production of the foam, some manufacturers apparently believe that they do not have to list them separately. Most of the current concern about flame retardants focuses on brominated flame retardants (BFRs). Brominated flame retardants are widely used for plastics, due to their effectiveness and relatively low cost. More than 75 of these compounds or mixtures are recognized commercially. Some are generic compounds made by a number of manufacturers; others are proprietary formulations that differ slightly from product to product. The best known BFRs today are PBDEs, HBCD, and TBBPA—full names and descriptions are in Table 2. While PBDEs are receiving a lot of attention today among health and environmental experts, this isn’t the first time brominated flame retardants have gained notoriety. In the early 1970s, the closely related polybrominated biphenyls (PBBs) were commonly used in a wide range of plastics, including polycarbonates, polyesters, polyolefins, and polystyrenes. PBBs were removed from the U.S. market after a notorious 1973 accident in which 2,000 pounds (900 kg) of a PBB known by the trade name FireMaster FF-1 (hexabromobiphenyl) was inadvertently mixed with animal feed in Michigan, resulting in widespread health and environmental problems. An estimated 8,000 to 12,000 Michigan residents were directly exposed to PBBs through meat, milk, butter, cheese, and eggs, and a total of 30,000 head of livestock and 1.6 million chickens ultimately had to be destroyed following this accident. Several years after the accident, only 10% of the Michigan population did not have detectable levels of PBBs in their blood, and many residents in Michigan—and elsewhere—still carry that toxic burden. At the time of the accident, 4.9 million pounds (2.2 million kg) of FireMaster FF-1 were produced annually in the U.S. Production of that chemical was terminated in 1974, but octa- and deca- forms of PBB (compounds with eight and ten bromines, respectively) were produced—exclusively for export—until the late-1970s. Another brominated flame retardant, tris(2,3-dibromopropyl) phosphate, or tris-BP, commonly used in children’s sleepwear, was banned by the Consumer Products Safety Commission in 1977 after studies showed it to be carcinogenic and mutagenic in laboratory animals. Worldwide, approximately 450 million pounds (200,000 metric tons) of the five most common BFRs were produced in 2001, according to the Bromine Science and Environmental Forum (an industry association). These five compounds—TBBPA, HBCD, and three PBDE mixtures (decaBDE, octaBDE, and pentaBDE)—account for the vast majority of BFRs sold. The breakdown of production by compound and region is shown in Chart 2. As can be seen, there are significant regional differences in the use of these flame retardants; decaBDE is the most common BFR in the Americas, while TBBPA is most common elsewhere. Three manufacturers dominate world production of BFRs: Great Lakes Chemical Corporation of West Lafayette, Indiana; the Albemarle Corporation of Baton Rouge, Louisiana; and the Israeli company Dead Sea Bromine Group. The largest quantities of brominated flame retardants are used in hard plastic computer casings, printers, televisions, and other electrical and electronic (E&E) components. Significant quantities are also used in building materials and furnishings. A few building-related applications and the most commonly used flame retardants are listed in Table 1. Additional application areas are listed in Table 2, which is organized by flame retardant. Unfortunately, it can be difficult for a specifier to find out just which flame retardants are used in a given product. While some materials are consistent in their flame-retardant use—polystyrene insulation is nearly always made with HBCD, for example—other materials differ from manufacturer to manufacturer in the flame retardants used, so generalities cannot be made. Unless (or until) there are consistent reporting requirements for flame retardants—even in small quantities—informed decision-making about products relative to flame-retardant use will be difficult. Design for the Environment program that is using the cradle-to-cradle approach developed by McDonough Braungart Design Chemistry to eliminate hazardous components, including halogenated flame retardants. The company is trying to eliminate all halogenated compounds from new products being developed, and they will then work at redesigning existing products, according to Gabe Wing, a chemical engineer with the company. Both the Aeron and Mirra chairs are free of halogenated flame retardants, and the company is working actively with chemical manufacturers and component suppliers to eliminate halogenated flame retardants from other products and components, including polyurethane foam that is widely used in office seating. Carpet tile and fabric manufacturer Interface, Inc. has been working to eliminate the use of BFRs companywide, according to Jim Hartzfeld of Interface, but they still have a long way to go. So far the company has eliminated all BFRs at its Canadian carpet tile plant, which makes product with PVC backing, and has cut BFR use by 75% in its LaGrange, Georgia plant, which produces non-PVC carpet tile. On the fabric side, comparable progress has been made over the past five years to eliminate BFRs, according to Hartzfeld, but new safety regulations may actually reverse some of that progress by mandating greater flame resistance. Given the very clear evidence of health and environmental harm that resulted from the accidental introduction of PBBs into the food system and environment in 1973, it is remarkable that other brominated flame retardants were able to largely escape scrutiny for nearly 25 years. Health concerns with current BFRs emerged only after Swedish studies demonstrated dramatic increases in PBDE levels in human breast milk. Dozens of studies since have shown how ubiquitous PBDEs have become in our bodies and in the environment. EBN. McDonald believes that children and adults pick up PBDEs through food (especially fish) and from direct indoor exposure through dust. Recent studies have found very high levels of PBDEs on window surfaces and in household dust. Infants ingest the compounds in breast milk and from household dust. A recent study of vacuum-cleaner dust from nine houses across the U.S. by the Environmental Working Group found PBDE levels ranging from 614 to 16,366 parts per billion, with an average concentration of 4,629 ppb. In a tenth house, where carpet padding had recently been removed, the PBDE concentration was over 41,000 ppb. reactive flame retardants—that is, they are held in place physically, rather than being chemically bound to the plastic molecules; over time, these additive compounds can escape. For an unknown reason, according to McDonald, a small portion of the population, about 5%, has very high levels of PBDEs compared with the rest of the population. “We don’t know why,” he said, adding that this is raising serious concerns. EBN. The red flag, in McDonald’s opinion, is that PBDE levels for that most contaminated 5% of the U.S. population (about 15 million people) are nearing concentrations that have been found to cause serious health effects in animal studies. “The current margin of safety is low,” he said. Toxicological Sciences by Swedish researchers reported that mice fed decaBDE on their third day of life exhibited behavioral problems that worsened with age—results were similar to findings of previous research in which mice were exposed to pentaBDE. EBN that there isn’t any evidence that decaBDE is a health risk. “It’s been proven to be clean,” she stated. A voluntary phaseout of decaBDE is not going to happen, she said, because there are no viable alternatives. Environmental Science and Technology. The Chemical Stakeholders Forum in the U.K. determined in March 2003 that HBCD is persistent, bioaccumulative, and toxic. The European Union is carrying out a risk assessment of HBCD, suspecting the compound of being an endocrine disruptor by impairing thyroid function. There are also growing concerns with TBBPA. In addition to worries about persistence, bioaccumulation in living systems, and estrogenic effects of certain brominated flame retardants, there are also concerns about the formation of brominated dibenzofurans and dioxins in the event of accidental fire or during incineration at the end of product life. These compounds, like their more familiar chlorinated versions, are highly toxic and considered to be very serious environmental contaminants. A December 2000 German report, “Substituting Environmentally Relevant Flame Retardants: Assessment Fundamentals,” commissioned by the German Federal Environmental Agency, examined a wide range of environmental impacts of a dozen common flame retardants. The creation of dioxins and furans was raised as a concern with decaBDE and TBBPA but not with HBCD. Table 2 summarizes health and environmental concerns with some of the more commonly used flame retardants, but this is by no means a comprehensive list of flame retardants. A number of actions have been taken to phase out use of brominated flame retardants. As noted previously, PBB and tris-BP flame retardants were banned in the U.S. in the 1970s, along with PCBs. PCBs were banned through the 1976 Toxic Substances Control Act, which gives the EPA authority to track industrial chemicals, require testing of chemicals, and ban chemicals if toxicity concerns arise. More recently, the European Union and two states in this country, California and Maine, have implemented bans of products containing more than 1% of pentaBDE or octaBDE, to take effect between the summer of 2004 (for certain uses in Europe) and the beginning of 2008. These actions to ban the penta- and octa- forms of BDE are fairly inconsequential, however, because the sole producer of these chemicals has already agreed to cease production. labeling of products containing decaBDE. In Europe, decaBDE is addressed in the RoHS Directive (Restriction of Hazardous Substances in Electrical and Electronic Equipment) but specifically exempted from the PBDE ban covering penta- and octa- forms, pending the outcome of a scientific risk assessment that will be completed by the end of 2004. EBN recommends that architects, specifiers, and builders minimize or eliminate the use of all halogenated flame retardants in buildings they work on. The highest-priority products are those made with PBDEs, including decaBDE, but any halogenated flame retardant should be considered suspect until thorough life-cycle toxicity testing has been conducted and the compound is demonstrated to be safe. EBN discovered, it is often very difficult to find out exactly which flame retardants are used in these products—this is not information that most manufacturers are interested in divulging. And current labeling regulations have thresholds or loopholes that allow manufacturers to avoid reporting flame-retardant content. Working toward the goal of eliminating halogenated flame retardants must not result in elevated fire risk. If more flammable materials are used, changes such as fire-resistant construction detailing and sprinkler use must be incorporated to compensate for the reduced fire safety of materials and furnishings. Product substitutions also should not sacrifice energy performance or durability. The checklist below provides some guidance in moving away from halogenated flame retardants. Finally, there is a need for research on the potential health and environmental hazards posed by flame retardants of all types. Designers, specifiers, and product manufacturers need good information on risk in order to make informed product selections. We need to be able to objectively compare different classes of flame retardants as well as various compounds within a particular chemical group.